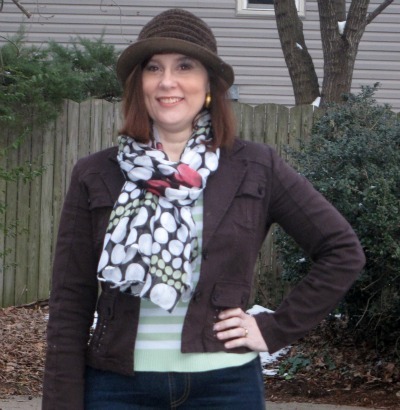 Yesterday I began this “Take one, Pass it On Remix Challenge” created by blogger, Sarah with the above outfit. Today I kept the striped top to create a new look. Since I started the shootie with a skirt look this season and am loving it, I wanted another opportunity to rock it before Spring arrives! I also began pattern mixing this season as well. Starting a blog has really opened up my playful side to fashion and that makes me very happy! Dear Readers can you guess which item I will keep for tomorrow’s look? This challenge may get trickier as the weather is warming up to the 60’s this week… What do you think of this challenge compared to the traditional 30 by 30 challenge where you restrict yourself to thirty clothing and shoe options to remix for a month? I love this because I don’t have to restrict my shoe choices! Come back tomorrow and see what I keep and what my choices are to keep for the following day. If you want to join in the fun remember you can post looks on my Facebook page. Linking Up with Real Girl Glam, so head on over and see what others are wearing and talking about! Gratitude: Not feeling very grateful today, thought I had figured out a solution to a problem and was handed a curve ball that left me without any idea for another possible solution… I am an easy going problem solver and optimist, but every once in awhile I feel severely tested and broken… a rare occurrence but reality… That was what how I originally felt until a reader left a comment which changed my entire outlook and to whom I am so grateful for the comment and letting me know that my blog is inspiring, as I have had a hole in my heart since closing my consignment store where i built up women and inspired them daily, which filled my spirit and made me soar. So if you are a lurker and haven’t yet commented, I hope you take note and realize your words have great power! Posting at 1 am as I am still awake and just in case Tuesday morning my sinuses are acting up like they were Monday Morning!!!! Love the rise in temperatures, but my sinuses don’t.. Suppose to be 65 today, but snow by Friday…. I am loving this no shopping thing as I am really exploring my closet and since beginning blogging I have been dipping my toes into the waters of Pattern Mixing.. Pardon me, if I keep repeating myself about the no buying thing and really working my closet… For someone who is a weekly thrifter, this is such a new and marvelous opportunity to dig into my closet and create! I took these photos on Sunday with my 12 year old late in the afternoon as the sun was setting so it was pretty cold and we did it very quickly… So glad for the warm up in temperatures!!!! I may even get to forgo my boots for a day and wear pumps!!!! I am so glad I embraced the pattern mixing trend and feel much more comfortable with it than I did in the beginning. Have you embraced this tend? Did you find it strange at first? Are you more comfortable after giving it a go? Chime in Readers, I love hearing from you! Gratitude: I am grateful to my husband for getting me sinus medication yesterday when my head hurt so bad I couldn’t move (nice reaction to the 10 degree increase in temps, wonder what another 25 degree increase Tuesday will bring?) I am grateful that the sinus medications worked and I made it out of bed by noon.. I am grateful that I took two sets of outfit photos on Sunday! I am grateful for all the comments left yesterday by my dear readers!